Do you need to write a paper for a class? Or, prepare a presentation for a ministry gathering? Or, choose a topic for a graduate thesis? Consider that an opportunity to learn more about honor and shame. The topic of honor and shame is becoming more common in mission circles, but there is still more ground to work. Your work could add to the broader conversation, and hopefully catalyze a ministry breakthrough. 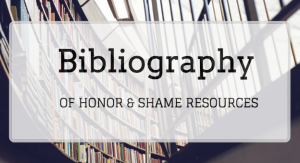 One reason I put together the bibliography of honor-shame resources is to make research as accessible as possible, for people like you. And, if you are living overseas with no library access, you can access many resources online. You’ll probably want more, but these are helpful starting points. All of the “articles” on the recommendations page are available online for free, just click the hyperlink. The journal Missiology has published articles about honor and shame over the years, and allows free access. The Jan ’15 issue of Mission Frontiers featured several articles. These two academic books are great resources: Guilt & Shame: A Key to Cross-Cultural Ministry by Hannes Wiher, and Honor & Shame and Orality by Chiang and Lovejoy. And if you find something worth sharing, post it on social media with #HonorTheology so others can connect with it as well. If you could learn the answer to any question about honor-shame, what question would you ask? Hopefully this post has sparked some ideas!